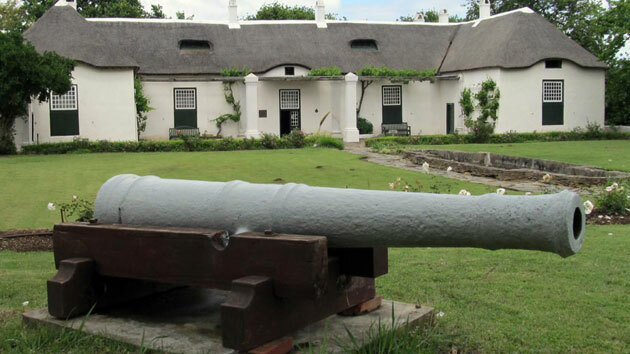 Leaving their mark on the region have been an intriguing mix of Middle Stone Age man, indigenous Khoi people, ostrich feather barons, woodcutters, farmers, gold-diggers, merchants, sailors, craftsmen, ordinary folk and even intrepid explorers such as Portugal’s Bartholomew Diaz who landed at Mossel Bay in 1488, as well as a modern-day diverse mix of tycoons and artists. Plettenberg Bay’s Nelsons Bay and Matjes River Caves were inhabited by Middle Stone Age man for more than 100 000 years, with the Khoisans leaving a legacy of tools and ornaments. Deposits of their tools, ornaments and food debris can be viewed in these caves, which are still being excavated. One can also observe the geological changes over millions of years which affected prehistoric life. Stilbaai, at the coast, boasts shell middens which date back 3 000 years, not to mention an abundance of fish traps. The presence of Blombos Cave, where it is believed that man first thought abstractly, is a further feather in the Garden Route and Klein Karoo’s history books. Long before Van Riebeeck landed at the Cape, Portuguese explorers of the 15th and 16th centuries called in and charted the bay, the first being Bartholomew Dias in 1487. Ninety years later Manuel da Perestrello aptly called it Bahia Formosa or the Bay Beautiful. The first white inhabitants were the 100 men stranded here for nine months when the San Gonzales sank in 1630. In 1763 the first white settlers in the Bay were stock farmers, hunters and frontiersmen from the Western Cape. The village of Harkerville was named for Robert Charles Harker, who, as a Government resident, controlled the affairs of Plettenberg Bay for 21 years. The family graves are one of the highlights on the Plettenberg Bay town day walk. Plettenberg Bay itself is an intriguing mix of cultures. A woodcutter’s post was established in 1787 and Johann Jacob Jerling, an early inhabitant, was commissioned by the Dutch East India Co. to build a storehouse for house timber which was to be exported. The Swede, Carl Peter Thunberg, was the first to document valuable observations on the bay and Robberg and the Governor of the Cape, Baron Joachim van Plettenberg, renamed the town Plettenberg Bay in 1779. In 1910 a Captain Sinclair set up the whaling station on Beacon Island to harvest the placid Southern Right whales but this ceased operation in 1916. The first hotel was erected by Hugh Owen Grant in 1940 and replaced in 1972 by the current well known landmark on Beacon Island. Today this modern town is comparable with Monaco, an exquisite emerald on shores of the azure-blue Indian Ocean; it basks between enchanting old villages. With over 300 days of sunshine a year and temperate climate, it celebrates with passion culture, spectacular nature offers, delicious cuisine, restoration of mind and body, high-adrenaline activities and land and water sports. But let’s continue our journey in the 1800’s when the growing timber trade led to Thomas Bain building Prince Alfred Pass (1868) and the 90km forest road through the Tsitsikamma to Humansdorp. Three major passes had to be constructed: Groot Rivier, Blauwkrantz and Storms River. The Great Fire of the 1868 claimed to have made Thomas Bain’s task of building the coastal road considerably easier. Bain started construction of the Groot River Pass in 1880, completing the work in 1883 with present road differing little from Bain’s original. Moving along the road towards modern day Nature’s Valley the first owner, Hendrik Barnardo, was employed at the convict station at Bloukrans established by Thomas Bain when building the road through the Tsitsikamma. Travelling through the decades to the early 1960s, Plettenberg Bay and environs also have had their share of suffering under the apartheid rule of the then South African government. Residents of colour who resided in the early town of Plettenberg Bay were forcibly removed to the outskirts of the town where they were settled in various informal settlements of New Horizons and Bossiesgif and Qolweni. New Horizons was built in 1968 as the first municipal town resulting from the apartheid group’s act. This township was opened without any infrastructure and the bucket system was used as toilets as water was delivered in tanks. Many of the residents were living in the main town of Plettenberg Bay and have colourful and poignant stories about their move. The first school, Formosa Primary, was built in 1969. Today it is still the only primary school in New Horizons, Theodora Crèche as well as Elim Crèche was built in 1970 with latter still in operation. KwaNokuthula is home to a varied number of ethnic groups and is Xhosa word meaning place of peace. More than half the population of KwaNokuthula used to reside in either Bossiesgif/Qolweni, on the outskirts of Plettenberg Bay or even as far afield as the Eastern Cape. Statistics estimates the population to be roughly 60 000. Street names in KwaNokuthula honour those who have been here since time immemorial or political and social activists. This information was originally published on Bitou Tourism.